And now, for those of you who prefer something a little more classically beautiful, may I present The World of Discovery Garden. 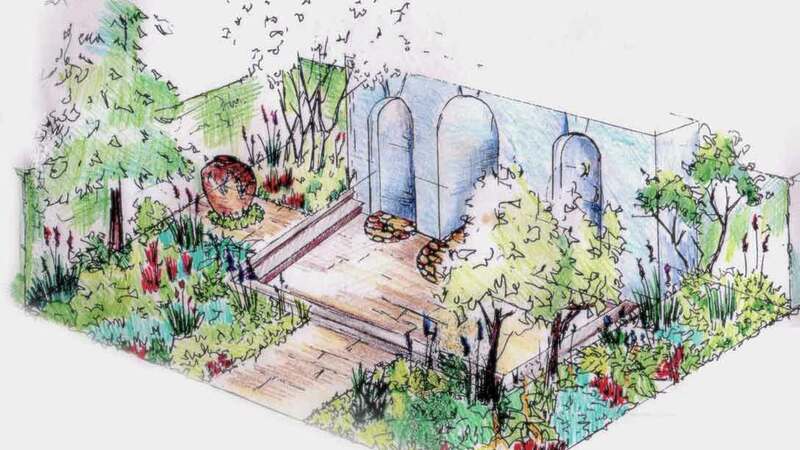 Fresh from RHS Chatsworth, where he presented a garden designed for a professional couple ‘inspired by brutalist form’, Paul Hervey-Brookes returned the horticultural stage with an altogether more harmonious design for Hampton Court’s sponsor, Viking Cruises. This garden, full of elegant touches and well-judged details, was created to reflect the personality and interests of a well-travelled couple who have accumulated architectural ideas, plants, colour combinations and artworks on their travels. Even without the backing of a sponsor in the hard landscaping business, this garden was endowed with a strong, simple structure, dominated by a feature wall inspired by the Arch of Constantine in Rome. 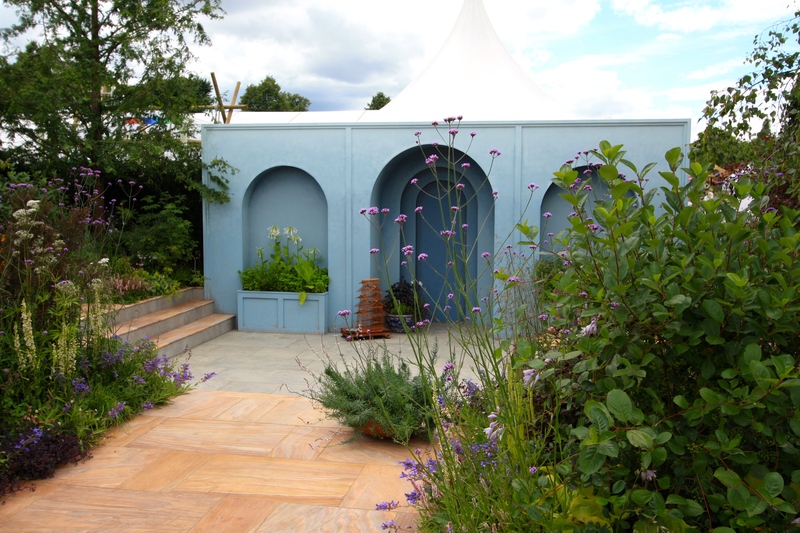 It reminded me immediately of the contemporary pavilion at Le Jardin Secret in Marrakech, albeit finished in more soothing grey-blue colourwash. I’m not sure if the siting of a mini marquee behind the wall was deliberate, creating the impression of a tented pavilion behind. However, the use of lime green Nicotiana sylvestris and bronze leaved dahlias next to the pale edifice was refreshing and lovely. Some elements of the design were not realised. The trio of recessed arches were intended to be cobbled beneath, but pebbles were replaced by painted planters. 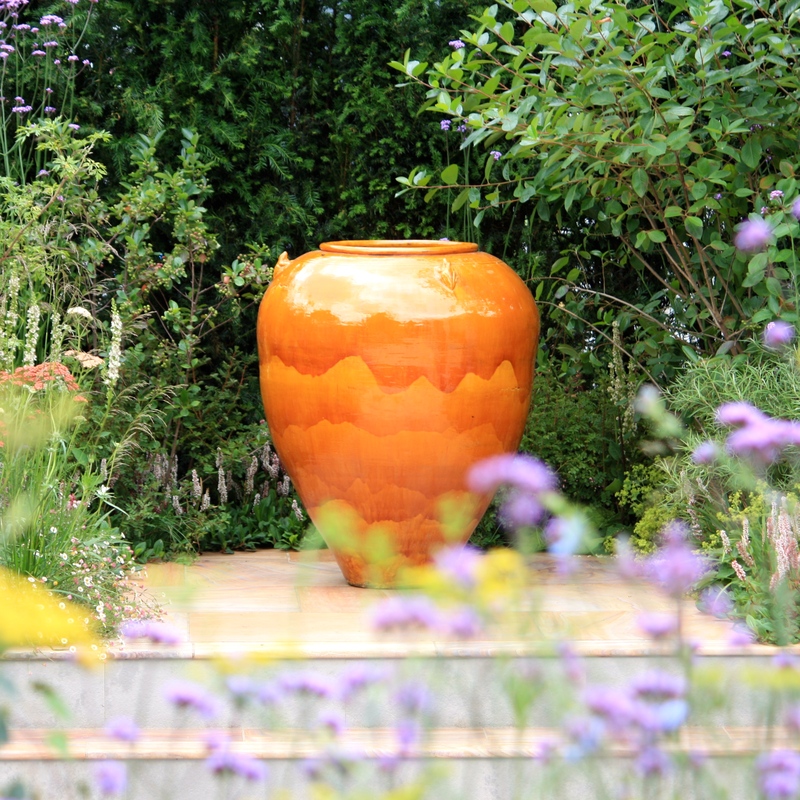 The judges paid no heed to any deviation from the original design and awarded the garden a well deserved gold medal. 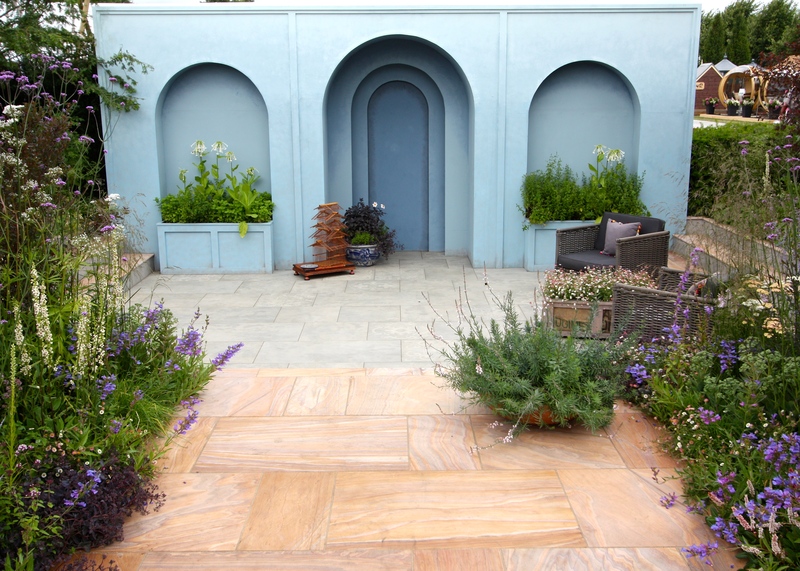 Armenian tiles in subtle shades of grey, taupe and pearl broke up the paving of a generous seating area. The garden’s planting was abundant and eclectic, not conforming to any particular pattern or matrix but matched very cleverly to each and every situation. This sensitivity reflected the planting style I so appreciated in the designer’s Chatsworth garden and shared some of the pink, white, blue and mauve tones. Very few specifics were included in the press briefing, which is a great shame as Paul Hervey-Brookes always includes such interesting plants in his designs. Of particular note was unusual Phytolacca bogotensis, a Chilean pokeweed with pinkish-red stems and magenta flower spikes, and dark-leaved aster Symphyotrichum lateriflorum ‘Lady in Black’. 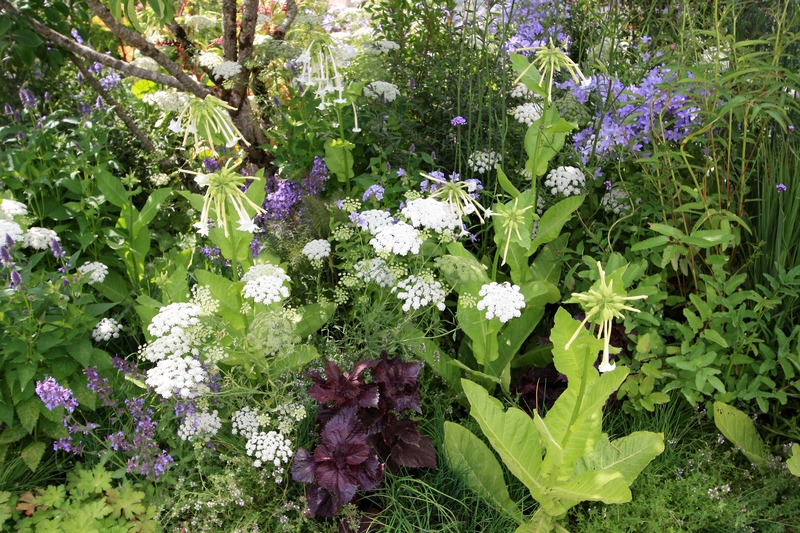 Vertical accents, in the form of Verbena bonariensis, Valeriana officinalis, perovskia, verbascum, liatris and nicotiana were plentiful, creating a swaying, gauzy veil through which to marvel at the pleasure garden within. If one had a substantial courtyard garden and deep pockets this might well be a garden to emulate. I enjoyed the simplicity of the layout and hard landscaping, coupled with exuberant, interesting planting. Little touches, such as an oriental birdcage and a planter fashioned from a packing crate and old coffee sacks, hinted at the sponsor’s raison d’etre, without ramming it down our throat. Although billed as a classical garden, I’d have described it as Temperate Islamic – a more feminine and exuberant version of what one might discover in a city such as Marrakech. Where this garden of discovery transported me personally did not matter, but it was definitely going places, winning a gold medal. In a show full of clashing colours and overt messaging, this was a quiet, calm, contemporary garden that did not need to shout to command attention. Your photo of the annual plants planting is beautiful as is the planting itself. Thanks for showing us this exciting creation. Yes, this is more like it! Plant lists are so helpful but I’m afraid I need a bit more help. What is the plant in the shallow round planter in last photo (and 3rd from top)? At first I thought it might be a lavender or prostrate rosemary but clicking on it, the flowers are pinky white, quite different. I am seeking inspiration for my own tiny, nowhere near as sunny, courtyard garden….many thanks! 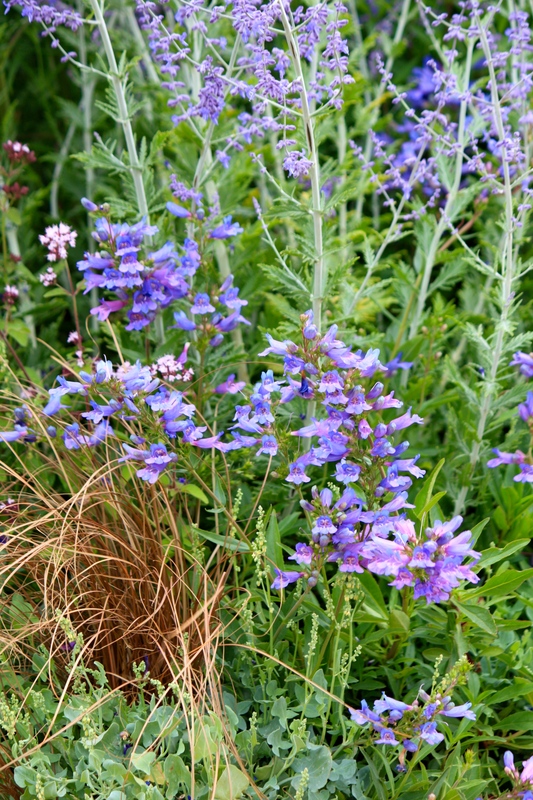 It’s in the list Anne – Linaria purpurea ‘Canon Went’. Likes sun I’m afraid. Good for a wall or paving.